We have very recently moved to Scotland and we are so lucky to have a wonderful plot of strawberries and a few raspberry bushes in our garden. 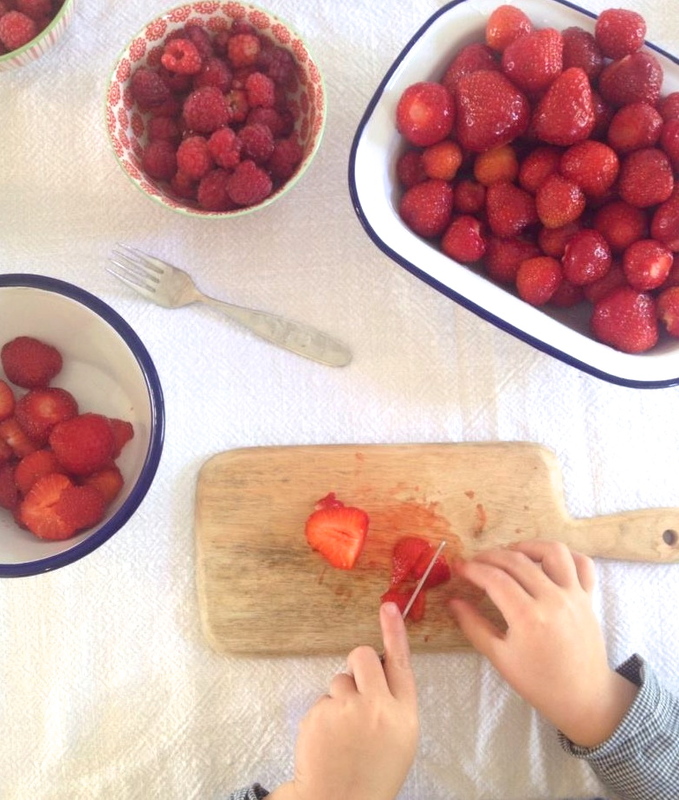 We have picked so many berries our fingers are stained pink and our bellies are bursting! But what I’ve loved most is that it reminded me of one of our favourite summer time books, Jamberry by Bruce Degen. Jamberry is the sweetest of board books. 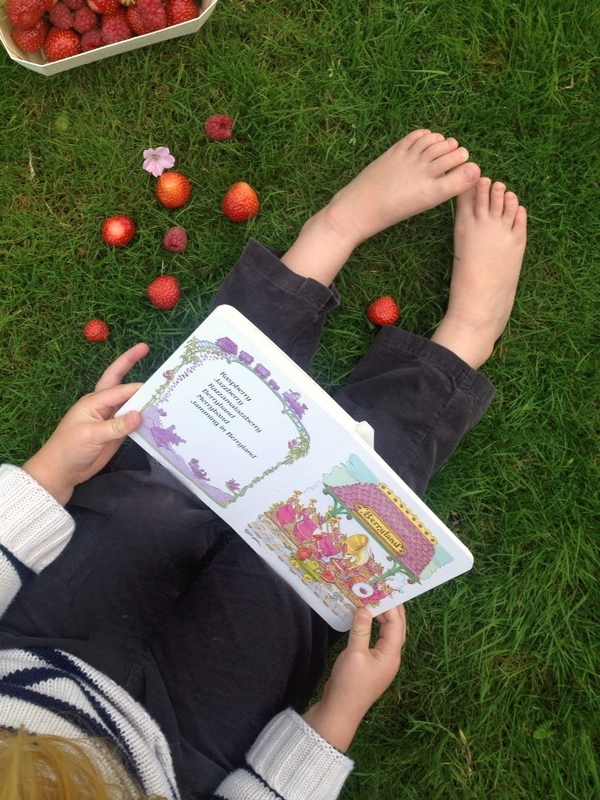 It’s about a young boy and a bear who merrily play through the land of berries. Their adventures are surreal and the word play Degen delights us with makes for a delicious classic. 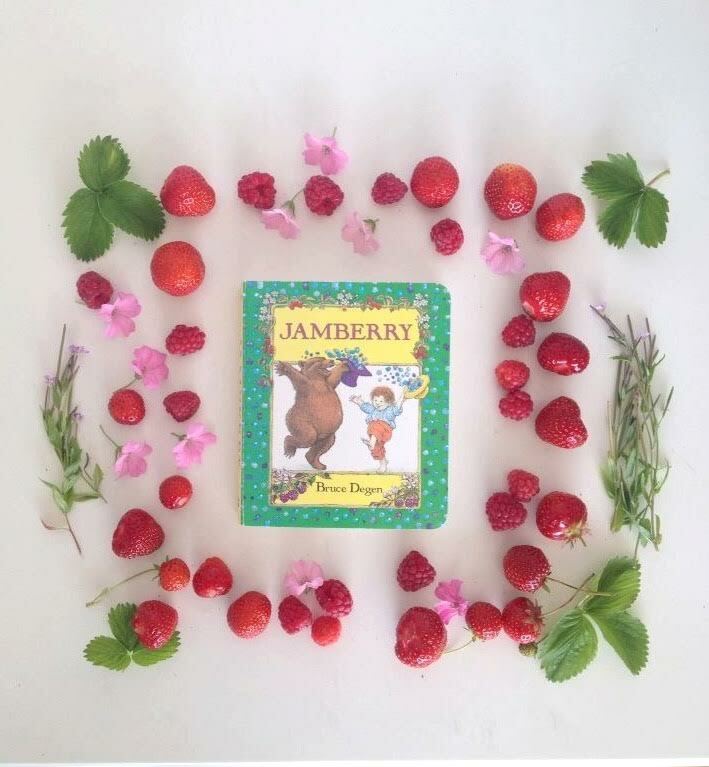 The characters sit in a canoe of blueberries with their hats bursting of berries and they lay in a meadow of strawberries with dancing lambs and ponies. Florence giggles all the way through this book, whilst Helena enjoys making up more crazy berry words! Bruce Degen, who also illustrates this book, is said to enjoy combining humour with art and it’s his bright images together with a mix of literary rhyme and alliteration that make us want to read this book over and over again. Having read Jamberry so many times last week, Florence and I decided to make some batches of jam with our collection of berries. She was such a great helper, picking the berries, plucking them clean, and squashing them into the sugar! 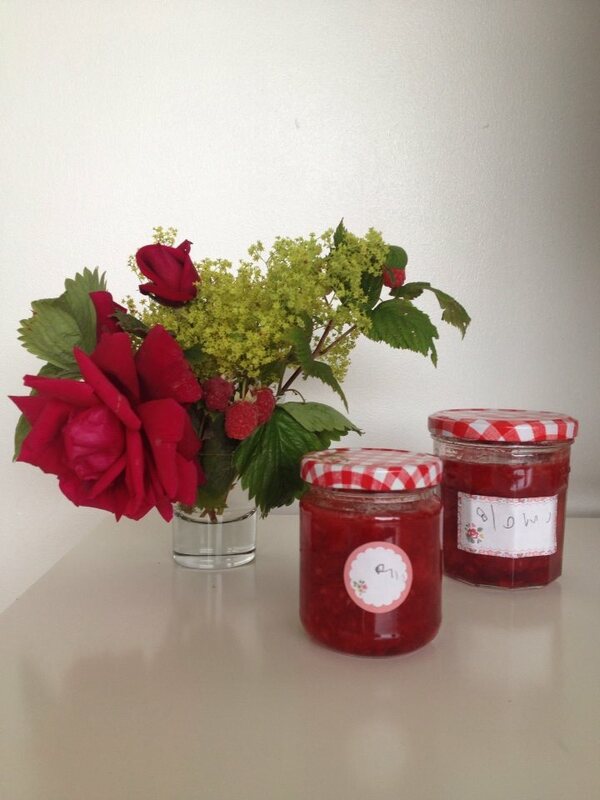 The recipe we used is River Cottage’s strawberry jam with sweet scented geranium leaves which I discovered last summer. The geranium leaf really compliments the flavour of the berries and the jam is even more delicious in a Victorian sponge cake with freshly whipped cream! Perhaps that’s something else I’ll make before the girls go back to school. The book is available from all good bookstores or online from Amazon (US and UK). Thank you Louise for the warm welcome! We’re in a small village in Deeside. I think it’s rained every day since we arrived but we’re kitting ourselves out with warm waterproof clothes! And I’m so excited about this review because I’ve never heard of this sweet book before. It looks like a fun one to read aloud! Welcome to Scotland! I’m sure you will be looked after where ever you may be. The book looks very sweet. What a lovely book! 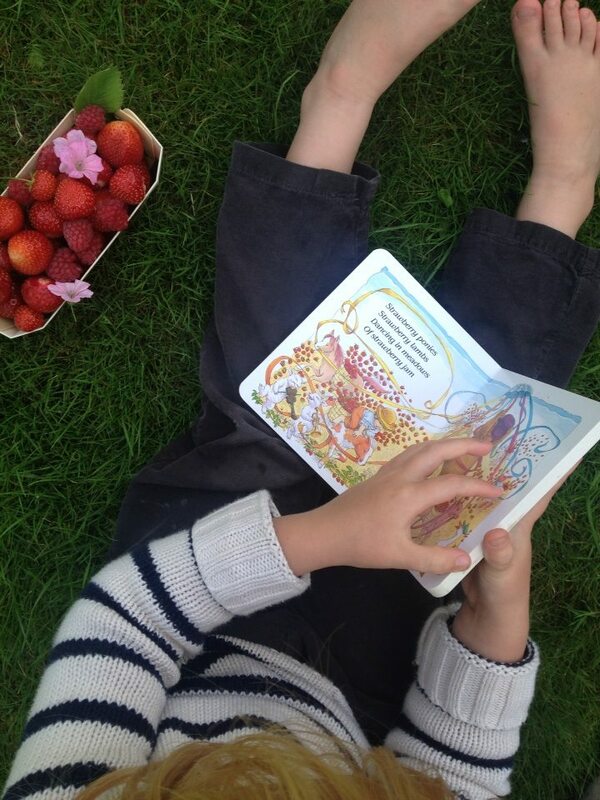 I’ve bought a few books you’ve recommended (on insta and Kirsten rickerts blog) and love them (love a curious fish!). Lovely to see you contributing here!